Jonah the Whale won’t be there in a playing capacity, but it’s going to be just as good, and almost definitely better than 1995 when Jonah used the English team for cleaning his boot studs. 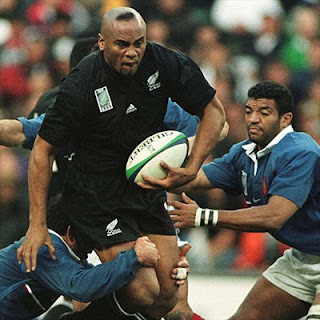 This time it’s a blackout for the opposition ala 1987, although I hope to be sober enough to remember Richie McCaw lifting the Cup at the end of this tournament. Jonah was hoping to play in France, but despite receiving his long-hoped for kidney transplant and a return to first division rugby, his acute nephritic syndrome has done permanent damage, and at the age of 32 he no longer has the speed required for a winger in the modern game. No matter. We’ve got a couple big Fijian boys on the outside, plus the evergreen Dougie Howlett, so we’re not missing anything on the outside. Mils Muliaina has the safest pairs of hands of any fullback in the business, as well as the best counter-attacking skills. There’s a guy from Otago called Nick Evans who would be a shoo-in for first-five-eighth in any other team in the world, but he has to play second-fiddle to the reigning world number one, Dan Carter. Centre is our only potential weakness, but Conrad Smith is back from injury, so probably no worries there. Byron Kelleher is the biggest halfback in world rugby and back for his third tournament, but he may end up playing understudy to the dynamic Jason Leonard. The ball skills of these lads when they’re on fire is a sight to behold. Then there’s the forward pack with undisputedly the best scrum in the world. Carl ‘Man Mountain’ Hayman (1.93m, 120kg) toyed with his Australian counterpart Matt ‘Fat Pudding’ Dunning during their last encounter like an 800-lb gorilla playing with a plasticene Tonka truck. Openside flanker Richie McCaw wins turn-over ball like a man betting on the sun coming up tomorrow, and blindside breakaway Jerry Collins has private health sector orthopaedic surgeons lining up for overtime to deal with his tackle victims. The All Blacks have a round-robin match against Scotland, but no doubt there’ll be a John O’Groats third XI match against Orkney Isle Amputees being televised the same day that will soak up the audience numbers in Caledonia. For the more enlightened, further information can be viewed here. Just 14 days to go till kick-off. Excellent, mate; really can't wait for it to start. Please keep us up to date on the big matches as the results come in. Yeah. And no "You're oot!" texted on the mobile this time.